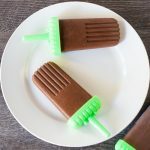 Super easy and delicious vegan chocolate Guinness and Bailey popsicles. Only 4 ingredients. In a small saucepan over medium heat bring the coconut milk to a boil. Remove from heat and add the chocolate chips. Let the chips sit for 1-2 mins then stir until they are well combined. Add the Guinness and the Baileys and mix again. Pour the mixture into popsicle molds and freeze for at least 3 hours or until completely set.